A Bug Tracking system (it may be also regarded as an Issue Tracking system) is a software application that maintains and keeps track of software bugs and / or business issues and automatically manages them through to resolution. Bug tracking system tracks issues, such as event, need, task, bug or item that can affect the outcome of a project. Bug tracking software is a great tool in software deployment and project management. Bug tracking software may be also regarded as a defect tracking software or an issue tracking software but the main task of bug tracking software is to maintain reported problems, issues, bugs, questions. Also a bug tracking software ensures that all reported bugs are categorized and assigned. Bug tracking software helps companies to track and assign business issues. The vital task of bug tracking software is to provide the coordination of multiple individuals within and even outside the company. Having a web-based bug tracking system is vital for a software development but it is also widely used as a great online project management tool for large or small companies to accommodate their business needs. If you are developing a software then bug and defect tracking is required to a successful software development process. If you are working with partner organizations to complete a business process or project and have many tasks that must be assigned and completed, then bug and issue tracking system is a great project management tool to organize your business and project management process. Using web based bug tracking software or online bug tracking tool, you share and track information on a work process in a timely manner, especially when team members are in different locations. 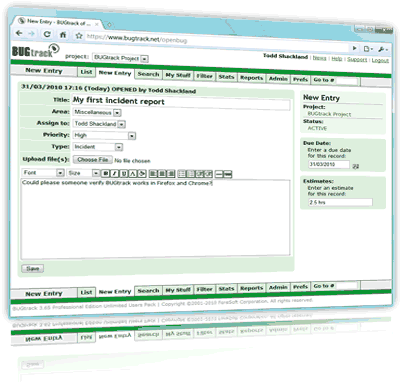 BUGtrack provides a hosted Issue Tracking and Defect Tracking application using the Software-as-a-Service (SaaS) model. Online bug tracking system is delivered to customers over the internet. BUGtrack is a hosted bug tracking system and online project management tool. Online issue tracking provides distinctive advantages for teams such as a simplified IT infrastructure, lowered total cost of ownership and increased cost predictability. Using Online bugtracker, project management teams can collaborate over the web with 24/7 availability. Project management involves managing and connecting with people to achieve the successful completion of specific project goals and objectives. BUGtrack is online project management software that brings everyone in the project team together and helps get the projects done faster and easier. Web-based project management centralizes all projects in one place. Online project management tool automatically distributes all tasks to the responsible team. Web project management software gives team members a list of tasks so there is no question about what they should work on. Web based project management is a very effective approach for companies who work with partners from different locations, countries or regions. Being an online project management tool, BUGtrack is capable to unify and coordinate your virtual team members regardless of their physical location. BUGtrack is an effective and flexible web-based bug tracker and online issue tracking tool to manage both business and technical issues for all teams. BUGtrack web based bug tracking is used by over 10,000 professionals in 34 countries. BUGtrack Defect Tracking Software is provided by ForeSoft Corporation, offering a number of SaaS products. You can start using this online issue tracking system right away. Moreover, you can change BUGtrack configuration to handle your web project management needs if they are more complex. More and more organizations begin to adopt online issue tracking software, they are searching for efficient and cost effective solutions. Using hosted bug tracking, web issue tracking software you don’t need to worry about routine maintenance, backups, and upgrades. "I think BUGtrack really fills up an existing gap in the testing area. No more sending documents with compilations of bugs between developers and testers. Now the flow is quicker and demands less manual work to compile and redistribute bugs. Since testers and developers can continuously have a dialog through BUGtrack over every bug, misunderstandings are quickly solved." Access real-time information from anywhere in the world, 24 hours a day, 365 days a year. Manage hundreds of projects in multiple locations OR just a few! Make informed decisions and minimize problems and errors. Integrate with source control systems, like CVS, Subversion and Microsoft Visual Source Safe. Create global teams and talk in local languages. Import email messages and have them automatically converted into trackable records.